This easy-to-read text combines research, practical strategies, and examples from K–6 classrooms that will inspire and engage mathematical minds. What does it take to be a good mathematics teacher who actively engages students and addresses learning differences? This easy-to-read text breaks down the complex components of mathematics teaching and divides them into practical strategies. Combining research, useful tactics, and examples from K–6 classrooms, the book includes reflection questions, action tasks, and activities to inspire and engage mathematical minds. Examine the aspects of instruction, assessment, and learning that must be cultivated in order to develop mathematical minds. Gain a mental picture of the essential elements of an effective mathematics classroom. Observe specific classroom examples and vignettes that illustrate the concepts covered in each chapter. Answer reflection questions to help relate the strategies in the book to those in the classroom. Perform call-to-action tasks that will help you take the next essential steps in teaching mathematics. Get advice on balancing teaching responsibilities and making sound plans for teaching mathematics. 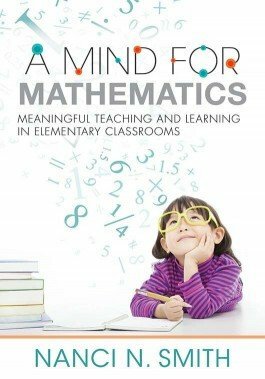 “In A Mind for Mathematics, Nanci Smith offers an easy-to-read, easy-to-implement book to help teachers navigate the teaching of K–6 mathematics. She not only provides great task-selection approaches and classroom strategies but also the research and practice base on which these approaches are founded. The belief in meaningful, important mathematics taught and learned with understanding by all students comes across as very achievable through her many practical strategies.